University of Rhode Island received a A.
U.S. News & World Report's ranking of 88 out of 117 of National Universities Top Public Rankings was a major contributor to this grade. "Though fraternities and sororities still dominate social life, this once-proud "party school" is a shell of its former self. This is a good thing, of course, for students looking to take advantage of URI's excellent pre-professional programs, "respectable academics," and very affordable in-state tuition." What is a typical University of Rhode Island student like? Describe the type of person that should attend University of Rhode Island. Someone who is laid back, but still likes to go out and have fun. Anyone who wants to join Greek life or just get a great education and get academically challenged should definitely come here. What are the top 3 reasons someone should attend University of Rhode Island? It's close to the beach. The students/people are great. It's also affordable, especially for in-state kids. What was a typical University of Rhode Island student like in high school? Describe the type of person that should attend University of Rhode Island. Strong programs include engineering, marine science, nursing, and pharmacy. Students are drawn to URI's strong academic departments, such as business and management, and to its low in-state tuition. The yield of admits who enroll is low and the state's population small. Students are pleased with the small class sizes, which allow them to work closely with faculty members. The University was chartered as the state's agricultural school in 1888. The Oliver Watson farm was purchased as a site for the school, and the old farmhouse, now restored, still stands on the campus. The school became the Rhode Island College of Agriculture and Mechanic Arts in 1892, and the first class of 17 members was graduated two years later. The Morrill Act of 1862 provided for the sale of public lands. Income from these sales was to be used to create at least one college in each state with the principal purpose of teaching agriculture and mechanic arts. From this grant of land comes the term "land grant," which applied to the national system of state colleges. In a later adaptation of the concept, federal funds given to colleges for marine research and extension are called "sea grants." 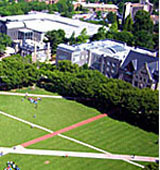 In 1909 the name of the college was changed to Rhode Island State College, and the program of study was revised and expanded. In 1951 the college became the University of Rhode Island by an act of the General Assembly. The Board of Governors for Higher Education appointed by the governor became the governing body of the University in 1981. What are the top 3 things that students do for fun at University of Rhode Island? There are so many beaches really close by, do when it's warm, or even cold, everyone heads over. Greek life is big so joining a sorority or fraternity is a good way to make a lot of friends. Campus housing is available for undergraduates. Housing deposit : $200.00. Housing deposit due : May 1. Housing deposit is not refunded if student does not enroll.. Freshman allowed to have car. No pets. 12% of male students live in fraternities. 13% of female students live in sororities. A program that focuses on the application of chemical techniques and instrumentation to the analysis and evaluation of physical evidence to aid in criminal investigations. Includes instruction in analytical, inorganic, organic, and physical chemistry; biochemistry; forensic toxicology; instrumental analysis; crime scene processing; criminal investigation; forensic laboratory technology; and applicable law. A program that prepares individuals to apply mathematical and scientific principles to the design, development and operational evaluation of systems to monitor, control, manipulate and operate within coastal or ocean environments, such as underwater platforms, flood control systems, dikes, hydroelectric power systems, tide and current control and warning systems, and communications equipment; the planning and design of total systems for working and functioning in water or underwater environments; and the analysis of related engineering problems such as the action of water properties and behavior on physical systems and people, tidal forces, current movements, and wave motion. A program that prepares individuals to apply the principles of marine/aquatic biology, oceanography, natural resource economics, and natural resources management to the development, conservation, and management of freshwater and saltwater environments. Includes instruction in subjects such as wetlands, riverine, lacustrian, coastal, and oceanic water resources; water conservation and use; flood control; pollution control; water supply logistics; wastewater management; aquatic and marine ecology; aquatic and marine life conservation; and the economic and recreational uses of water resources. 83% of students graduated in the top half of their class. The average student pays $17,090 for tuition, fees, and other expenses, after grants and scholarships. Total stated tuition is $10,878, in-state and on-campus, before financial aid. Learn more about financial aid at http://www.uri.edu/es/menus/finaid.html. Estimate the net price for you at http://www.collegeportraits.org/ri/uri/estimator/agree. The typical (median) early career salary of University of Rhode Island graduates is $46,700, according to Payscale. University of Rhode Island participates in the NCAA Division I-AA for college athletics. Want more info about University of Rhode Island? Get free advice from education experts and Noodle community members. Is audiology testing done for veterans at URI campus?